I’ve been working in Germany this past weekend, giving classes and piano workshops in a busy town in the Ruhr. I do this two or three times a year. My students are invariably an eclectic group of all ages and abilities, intent on improving their playing. We work for two days and then present a little concert at the end. The venue for these classes sometimes changes, but the concept is always the same. The course is becoming increasingly popular, and provides an opportunity for pupils to develop various piano skills. 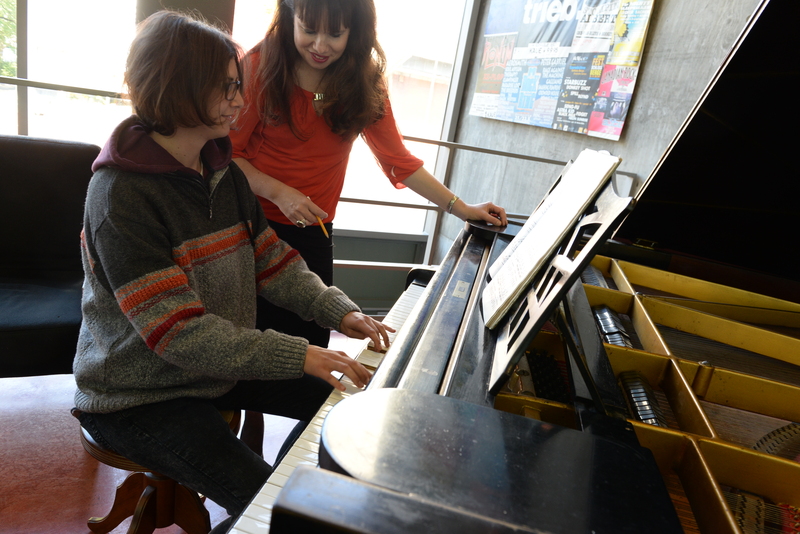 I work closely with course organiser and singer Kery Felske, and together we try to vary the content slightly; adding a new aspect of piano playing each time (which might involve highlighting anything from sight-reading or scales to the importance of posture). The topic on this occasion was breath control. Once this useful skill has been assimilated, it can be added to the smorgasbord of performing tools in a pupil’s ever-increasing armoury. At the beginning of every session, we practised deep breathing, which can be effective for all types of performing. The class visibly relaxed after around ten minutes, and those who employed this technique before the concert said they found it beneficial. Stand up straight; your feet parallel with the width of your shoulders. Knees should ideally be flexible and not at all stretched, so that moving is easy (imagine you are preparing to Ski, with the knees in a slightly bent position). Sway from side to side freely, and find your centre by allowing body movement to become smaller and smaller. Breath through the nose and imagine your stomach is filling with air, encouraging the diaphragm to contract downwards (wear elastic or comfortable clothes!). When you intake air, make sure the belly is totally supported, so it is able to expand fully. Hold the air-filled stomach for a moment, then change the breath direction from breathing in to breathing out. Start breathing out by pursing the lips, making an ‘F’ sound, thus allowing yourself to feel a connection between the air-filled stomach and the mouth. Aim to be aware of a pillar of air between the stomach and mouth. Hold this position for as long as possible. As you release the diaphragm, the muscles of the stomach will take over, supporting your breathing as the air releases. Watch how the stomach caves in and finish with a ‘shh’ sound, making sure all air has been expelled. Then, once again, change direction of your breath, as you repeat this process. When executed correctly, you may feel slightly dizzy to begin with, and if so, take more time and slow down (or stop for a while and try again later). Repeat the process around five times at the most to start with. It should be done rhythmically and with purpose. Breathing out must take longer than breathing in. Breathing in could be considered the passive part of this exercise, and breathing out, the active part (it’s possible to stand or sit whilst doing this exercise). Once ingested, you will hopefully feel a sense of tranquility by the end of the process. The ‘flight or fight’ instinct will calm sufficiently and this may help alleviate nerves, or at least help to control the rapid breathing associated with nervousness before and during a performance, as well as aiding concentration whilst playing. With Katharine Pilgrim during a workshop session. Hi Irene, Probably January/February 2016. We try to run two or three a year….